Description. Yuma myotis are small bats and one of the smaller species of Myotis in Washington. Of the two subspecies occurring in the state, M. y. saturatus has dark brown to chestnut fur and dark ears and wings, whereas M. y. sociabilis has pale yellowish or grayish-brown fur with pale ears and wings (van Zyll de Jong 1985, Nagorsen and Brigham 1993). The underparts are paler than the back in both subspecies. The ears are relatively short and reach the nostrils when pressed forward; the tragus is about half the length of the ear and blunt in shape. The calcar is not keeled. Yuma myotis and little brown myotis are similar in appearance and size, which can make identification difficult. Yuma myotis usually have duller dorsal fur, a sharply sloping forehead, and slightly shorter forearms than little brown myotis, but these characters are variable and therefore unreliable for separating the two species (Weller et al. 2007, Rodhouse et al. 2008). Weller at al. (2007) obtained about 90% reliability in identifying the two species using a combination of forearm length and echolocation call characteristics, but recommended use of genetic testing to obtain complete certainty of identification. Taxonomy. Six subspecies are recognized (Simmons 2005), with M. y. saturatus occurring in western Washington to about the crest of the Cascades and M. y. sociabilis present in eastern Washington, including the eastern Cascades (Dalquest 1948, Hall 1981, van Zyll de Jong 1985). Distribution. This bat ranges from southeast Alaska and western Montana south to western Texas and central Mexico (Hall 1981, Wilson and Ruff 1999; Appendix A). Yuma myotis are widely distributed in Washington, with records existing for nearly all counties (WDFW WSDM database). Some records may be erroneous because of past confusion with little brown myotis. Population status. This species is widespread within its geographic range and can be locally abundant, but population sizes and trends are unknown, including in Washington (NatureServe 2009). Population status in Washington is somewhat difficult to infer from capture results because of potential confusion with little brown myotis. Overall, Yuma myotis are considered common in the state (Dalquest 1948, Fleckenstein 2000) and it ranks as one of the more common species at some sites in the Cascades (Erickson 1993, Frazier 1997, Christophersen and Kuntz 2003), northeastern Washington (Campbell 1993, Sarell and McGuinness 1993), at Moses Coulee (Rosier and Rosenberg 2006), on the Olympic Peninsula (West et al. 2004), and the lowlands of western Washington (Dalquest 1940, Johnson and Johnson 1952, Scheffer 1995, Falxa 2008a). Additional studies from the Cascades and Columbia Basin that have lumped Yuma myotis and little brown myotis because of identification problems suggest that Yuma myotis may be common or fairly common elsewhere (Christy et al. 1995, Taylor 1997, Erickson et al. 1998, Jenkins et al. 1999, Petterson 2001, Gitzen et al. 2002). In contrast, several surveys have found this species to be relatively uncommon or rare in eastern Washington (Fleckenstein 2000, 2001a, Baker and Lacki 2004, Lindsey et al. 2012) and western Washington (West et al. 1984, Thomas 1988). Within its range in British Columbia, it is the most common bat netted over water (Nagorsen and Brigham 1993). Habitat. 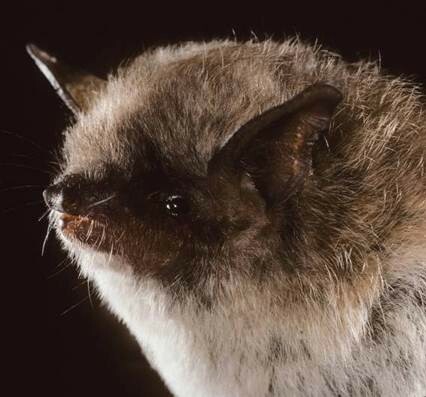 Yuma myotis reside in moist and dry forests, riparian zones, grasslands, shrub-steppe, and deserts, and are closely associated with rivers, streams, ponds, and lakes (Barbour and Davis 1969, Whitaker et al. 1977, Nagorsen and Brigham 1993, Wilson and Ruff 1999, Adams 2003, Falxa 2007b, 2008b, Lucas 2011). This species is generally found at lower elevations (Johnson and Cassidy 1997). Records extend up to 730 m elevation in British Columbia (Nagorsen and Brigham 1993), but reach as high as 3,050 m in other parts of the West (Adams 2003). Roosts and roosting behavior. Buildings, bridges, cliff crevices, caves, mines, and trees are used as summer day roosts, especially when located near water (WBWG 2005). Maternity colonies occupy buildings, caves, mines, and the undersides of train trestles and piers (Adams 2003; WDFW WSDM database). In the Pacific Northwest, large maternity colonies in buildings and other human- made structures appear to contain more individuals (1,500-4,100 adults; Nagorsen and Brigham 1993, Holroyd et al. 1994, Falxa 2008b, West et al. 2011) than those in caves and mines (500-750 adults; Betts 1997). Roosts with as many as 10,000 individuals have been reported in the Southwest (Cockrum et al. 1996). Nursery roosts are commonly shared with other species, especially little brown myotis (Wilson and Ruff 1999). The largest known colonies of Yuma myotis in Washington are located at Hanford (4,100 adults; West et al. 2011); in Whitman County (2,300 adults; WDFW WSDM database); near Olympia (about 2,000 adults; Falxa 2008b); and in Lincoln County (1,500 adults; WDFW WSDM database). Dates of occupancy at two of these colonies extend from early April to late October at Hanford (Lucas 2011) and from late April to late August near Olympia (Falxa 2007b). A nursery colony with 1,100 adult female Yuma myotis in three adjoining bat houses in San Juan County is also noteworthy (WDFW WSDM database). Ambient air temperatures in nurseries can reach up to 40ºC (104ºF) in buildings (Nagorsen and Brigham 1993, Lucas 2011), but only 14-20ºC (57-68ºF) in mines (Betts 1997). By roosting in clusters in domed areas of mines, bats can raise the temperature of these sites substantially above ambient (e.g., up to 37ºC [99ºF], Betts 1997), thereby reducing thermoregulatory costs. Betts (1997) reported that high relative humidity (>90%) during the nursing period appeared to be more important than ambient temperature in the selection of maternity sites in eastern Oregon. High humidity reduces evaporative water loss in bats roosting in high ambient temperatures. Pregnant and nursing females are also known to roost solitarily in large living conifer and hardwood trees at sites with substantial forest cover near water (Evelyn et al. 2004). Females roosting in trees switch sites about every 5 days on average. During summer, males roost singly or in small groups during the day in buildings, caves, rock crevices, trees, and stumps away from nurseries (Nagorsen and Brigham 1993, Wilson and Ruff 1999, Waldien et al. 2003). Tree roosting individuals prefer large living conifer and hardwood trees in areas with high forest cover near water (Evelyn et al. 2004). Small numbers of adult males have also been captured emerging from sites with maternity colonies from late August to mid-September (Lucas 2011). Night roosts have been found on porches, in buildings, and under bridges (Nagorsen and Brigham 1993, Pierson et al. 1996, Maser 1998, Adam and Hayes 2000, Falxa 2008a). Concrete bridges are favored over other bridge types (Adam and Hayes 2000). Adult females show strong fidelity to the same night roost in subsequent years (Pierson et al. 1996). Winter roost selection is poorly known in the Pacific Northwest (Nagorsen et al. 1993). Hibernating Yuma myotis have been found in caves in coastal Washington (Nagorsen and Brigham 1993), in lava tubes in Skamania County (Senger et al. 1974), and a former underground water storage structure at Hanford (Lucas 2011). Hibernation occurs from late October or early November until March in eastern Washington (Lucas 2011) and western Oregon (Maser 1998). Reproduction. Sperm production increases during July and August (Herd and Fenton 1983) and mating occurs in autumn prior to hibernation (Adams 2003). Ovulation and fertilization are delayed until spring (Adams 2003), and females give birth to a single young. Births occur primarily in the first two weeks of June to at least late June in western and eastern Washington (Dalquest 1948, Falxa 2007b; J. Lucas, pers. comm. ), from early June to mid-July in British Columbia depending on annual conditions (Fenton et al. 1980, Herd and Fenton 1983, Grindal et al. 1992, Milligan and Brigham 1993, Nagorsen and Brigham 1993, Holroyd et al. 1994), and from late June to mid-July in eastern Oregon (Betts 1997). Births may be substantially delayed or reduced in years with cooler wetter weather (Grindal et al. 1992). Milligan and Brigham (1993) reported that juveniles were able to fly and had stopped nursing by early August. Females are capable of breeding during their first autumn, but the age of sexual maturity in males is unknown (Nagorsen and Brigham 1993). Survival in juveniles is lower than in adults (Frick et al. 2007). Food habits and foraging. A variety of arthropods are eaten, with aquatic insects (i.e., caddisflies, mayflies, and midges), moths, beetles, neuropterans, leafhoppers, termites, and spiders being the most common prey reported in Oregon and British Columbia (Whitaker et al. 1977, 1981a, Herd and Fenton 1983, Brigham et al. 1992, Kellner and Harestad 2005, Ober and Hayes 2008a). Foraging begins shortly after sunset (Whitaker et al. 1977) and occurs mostly low over water and in adjacent shoreline vegetation (Whitaker et al. 1977, Fenton et al. 1980, Herd and Fenton 1983, Brigham et al. 1992). Along rivers and streams, Yuma myotis fly in relatively straight patterns up and down the watercourse, whereas circular flight patterns are used over ponds and lakes (Whitaker et al. 1977). The species is known to commute up to 13 km one way between day roosts and feeding sites in lowland western Washington (Falxa 2008b). Seasonal movements. No information is available on this topic. Threats. This species is vulnerable to disturbance of maternity roosts and hibernacula, destructive pest control activities in buildings, closure of abandoned mines, and some management practices affecting riparian zones and forests (WBWG 2005). Yuma myotis are especially likely to abandon roosts when disturbed by people (Verts and Carraway 1998). Conservation measures. Protection of nursery colonies and hibernacula from human disturbance is a priority. Where eviction from buildings is necessary, appropriate actions should be taken to minimize negative impacts on the bats. Buildings, caves, and mines should be surveyed to determine seasonal occupancy by this species, with appropriate precautions taken to minimize disturbance by surveyors. Because of the dependence of this species on aquatic habitats and associated insects for food, it is important to avoid human activities that destroy or degrade riparian habitats and water quality. Protection of large trees along stream corridors should be continued as a means for providing potential roost sites.